In late March, Austin Humanists at Work along with Keep Austin Fed received a large donation from a local anonymous donor. It was a wonderfully overcast morning to bring together over 25 volunteers, who sorted through seven pallets of hand soap, lotion, room deodorizer, maxi pads, trash can liners, moist wipes, and small dustpan and brush sets. 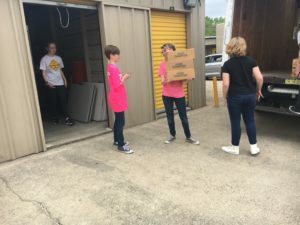 Each organization brought two moving trucks to move items back to their storage locations. 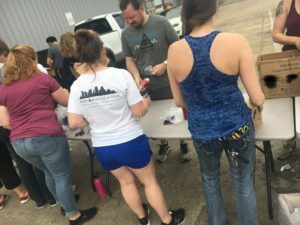 Not knowing how long this kind of donation would take to process, the volunteer coordinator in charge reserved both Saturday and Sunday with the volunteers who signed up. 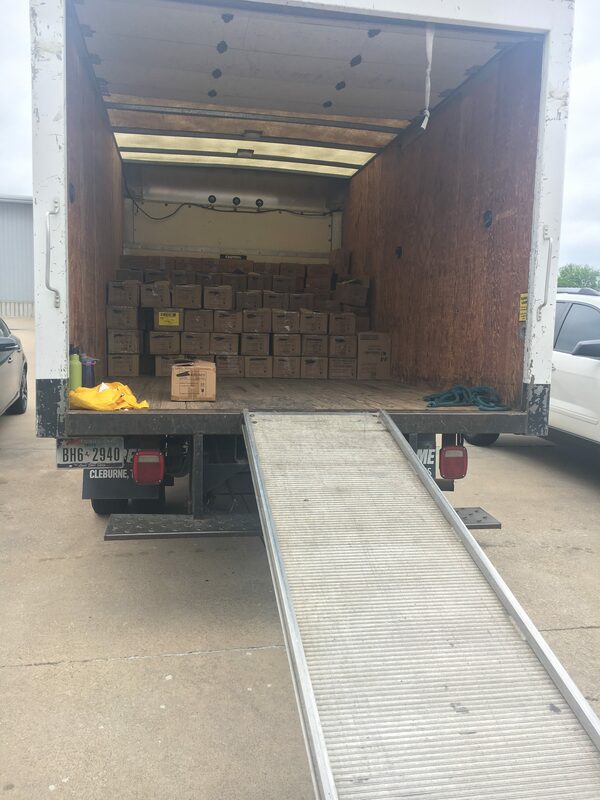 Each day had two-hour times slots from 9 a.m. – 5 p.m. We are very excited to report that all seven pallets were processed and loaded by 12:30 p.m. on Saturday. When we say, “we can’t say enough about our volunteers,” we truly can’t. Even two strangers who were just at our location to pick up a shipment leant a hand to help our donation efforts. It was a magnificent morning and many thanks are in order. We are very thankful for our ongoing relationship with Keep Austin Fed, which shared this donation with Austin Humanists at Work. Thank you Keep Austin Fed. A huge thank you to all the volunteers who came and sorted through this donation in only three and a half hours. There were also girls from a local robotics team, FRC Team #2881, The Lady Cans. Although the donor wishes to remain anonymous, we give you a resounding “thank you” for working with us to make this happen. 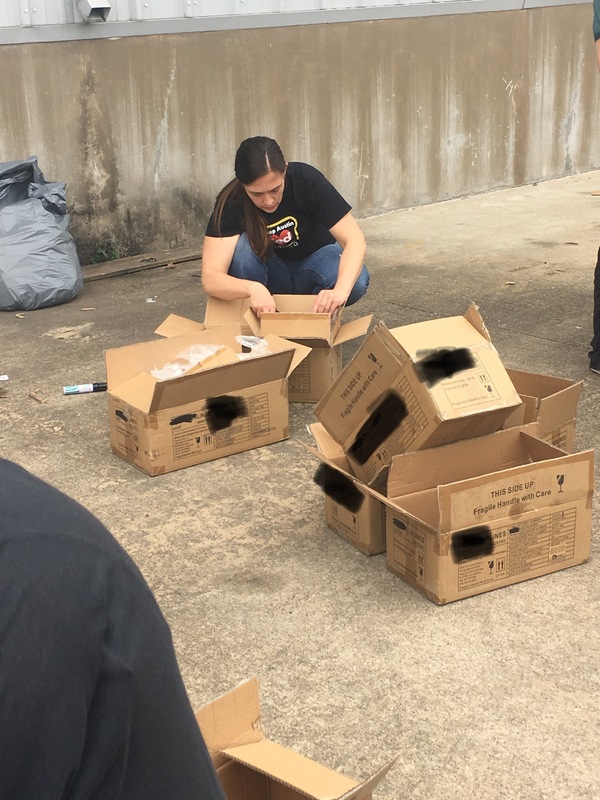 Since our name change almost two years ago, and since becoming a 501(c)3 non-profit in November, Austin Humanists at Work has been growing by leaps and bounds, requiring the need for more room for our giveaway items. 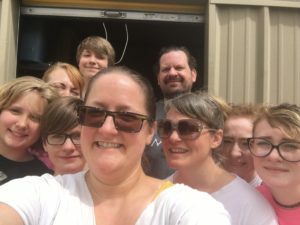 An additional thank you goes to Carolyn and Roger Patrick for sponsoring a our new storage space. Carolyn and Roger have been one of our fabulous donors and volunteers for over three years. Our organization is very thankful for them and are humbled by their generosity. What kind of donations do you accept?? Thanks for reaching out and let us know if you have any other questions.